The paw paw genus (asimina) contain the largest edible fruit indigenous to this continent (says wikipedia). They apparently taste like a cross between a banana, a mango, and a pineapple. 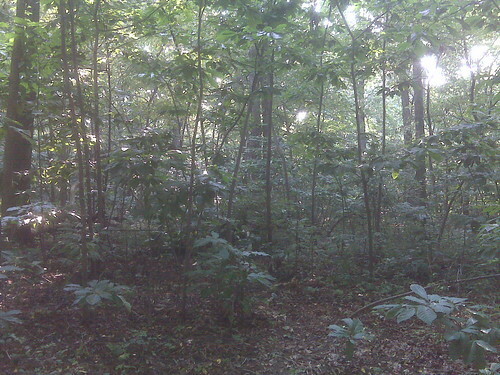 I’ve just begun learning about paw paws and recently was at a paw paw forest about an hour away. The big leaves give the plant away, but the fruit are even more distinguishable. Paw paws a very fascinating, I would recommend the wikipedia entry as a good introduction. Kentucky State University is building a great website for paw paw information and research of which there is surprisingly little. Compared to standard orchard fruits, not a lot of people are working with paw paws because they have a very short shelf life. For the backyard orchardist who doesn’t have to worry about shipping and storage, the paw paw could be an easy delicacy. Due to the fact that they’re indigenous, they are extremely pest resistant. There’s one paw paw on the Urbana Fruit Map in someone’s yard and they’re not overhanging the sidewalk (yet), so don’t take any! Paw paws grow densely in the understory layer. Next time you take a ride down Washington St stop and take a look at the beautiful trees with the big leaves. Hey! I noticed the same pawpaw tree just the other day. My wife and I are thinking about putting a couple in our yard, but are still undecided due to the reported time until fruiting (3-8 years) and the fact that we’ve never tried them before. Supposedly there are some pawpaws in Busy Woods ( http://www.illinoiswildflowers.info/woodland/plants/pawpaw.htm ), but I haven’t been yet to check it out. I’m interested, where’s the pawpaw forest you mentioned in your post? Can I get directions? Keep in mind however its not just a campground, there are lots of permanent residents there. 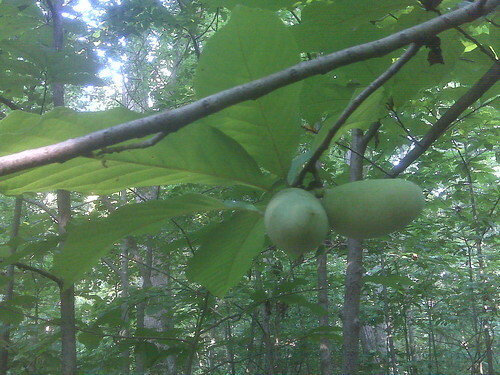 I’m thinking about going to collect paw paw seeds sometime in the next couple weeks. The ripeness should be peaking sometime soon.